This Thai temple was built in 1845 by a Buddhist monk, who came from Thailand. The five acres of land was donated by Queen Victoria to the Thai community. The legend about the monk tells us, that he was very fond of the local speciality of Penang, which is called "laksa". Even today devotees bring a bowl of laksa as an offrand to his shrine. 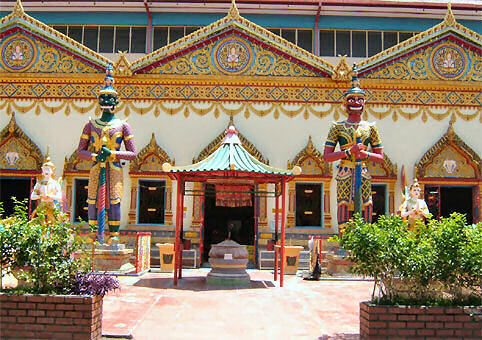 You can find the temple of the Reclining Buddha in Lorong Burmah, Pulau Tikus. 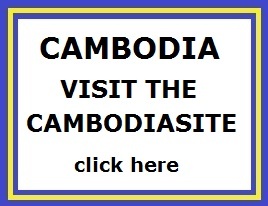 The opening hours are from 6.00am till 5.30pm. The entrance is free. Just as you get out of the Wat Chayamangkalaram temple across the road you see the Dharmikarama Burmese Temple. This also worth a visit. If you're walking in the courtyard towards the main temple, you are greeted by two awesome looking green-faced guards before the temple entrance. At their feet are crawling two mythical dragon-headed serpents. You are allowed to take photographs, but don�t forget to take your shoes off before you go inside the temple. Inside is a 33-meter gold-plated reclining Buddha. It's said to be third largest in the world, but that is not true. Actually is the 14th largest in the world. He sleeps by turning his body to right side and left leg put over right one. This position on the couch symbolizes the Mahaparinirvana (Enlighthenment or achieving Nirwana) of the Buddha which took place at Kushinagara (Uttar Pradesh, India). A peaceful half-smile gracing its serene face. When you have a better look in the temple, you'll see a lot of Buddha's all in different positions. 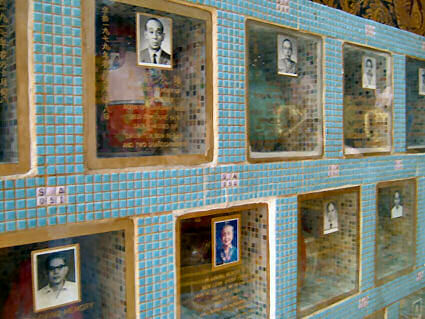 At the back of the reclining Buddha you'll find a lot of niches. They contain the ashes of the devotees. Behind the temple is a small Thai village and a Thai cemetery. Local Thais celebrate the traditional Buddhist festivals (the Sonkran and the Loy Krathong) at Wat Chayamangkalaram. 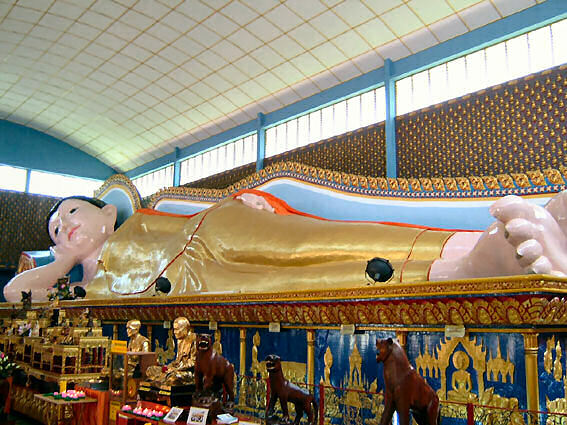 The reclining Buddha represents Shakyamuni Buddha (the historical Buddha) at his death. It is said that the Buddha knew death was approaching, and asked his disciples to prepare a couch for him in a grove. He lay there, reclining on his right side, facing west, with his head supported by his hand, as he passed into nirvana. The statue of the Reclining Buddha is not supposed to evoke sadness, but rather encouragement that all beings have the potential to become enlightened and attain release from the sufferings which characterize the cycle of rebirth. The reclining Buddha's serene, composed, and restful demeanor (he is actually slightly smiling) a reminder of the serenity that comes with enlightenment. The Buddha was born Siddhartha Gautama, a prince of the Sakya tribe of Nepal, in approximately 566 BC. When he was twenty-nine years old, he left the comforts of his home to seek the meaning of the suffering he saw around him. After six years of arduous yogic training, he abandoned the way of self-mortification and instead sat in mindful meditation beneath a bodhi tree. The Buddha wandered the plains of northeastern India for 45 years more, teaching the path or Dharma he had realized in that moment. Around him developed a community or Sangha of monks and, later, nuns, drawn from every tribe and caste, devoted to practicing this path. In approximately 486 BC, at the age of 80, the Buddha died. Niches with urns. They contain the ashes of the devotees.